First and foremost, JDeVereS is a writer, whether he is producing scientific “white papers”, “point papers”, technical manuals. poetry, a wide genre of magazine articles… or full-length novels… HE WRITES! In the traditions of Tolkien, Asimov, Le Guin, Norton, Jordan and so-o-o many others… he writes! First published in his early 20’s as a poet and celebrity interviewer, he has constantly sought ways to bring humanity together! To understand that most people on this earth are good people… than only those who seek wealth without balance, power without control cripple our civilization! 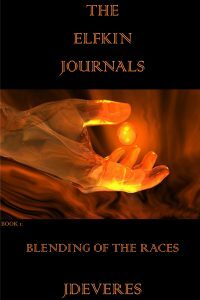 “The Elfkin Journals: Blending of the Races” – is a tale of true heroes seeking to create a balance between good/evil! It is the author’s “shout out” – that all people – in all countries must be allowed to find their balance!